You may have seen my post on Instagram about this. The other day, Mr. UpCyclist left this catalog photo for me and a note. 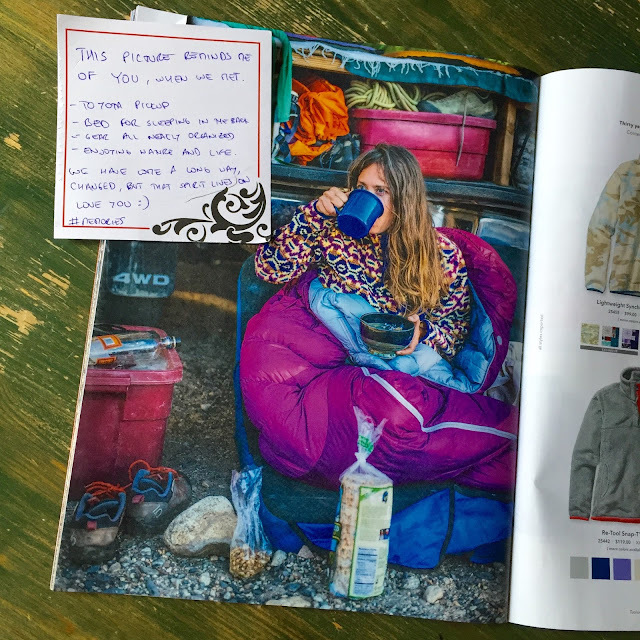 The catalog is Patagonia's newest catalog, by the way. They graciously employed me all through grad school. I love that company. The note read, "This picture reminds me of you when we met. Toyota pickup, bed for sleeping in the back, gear all neatly organized, enjoying nature and life. We have come a long way, changed, but that spirit lives on! I may live in one of the most populated parts of the US, have a "real" job, and my sweet Toyota truck was traded in years ago, but man, do I love my roots - our roots. I love messy hair, adventure, living on wheels, all things outdoors, and having a mate that appreciates the spirit of those things, too.